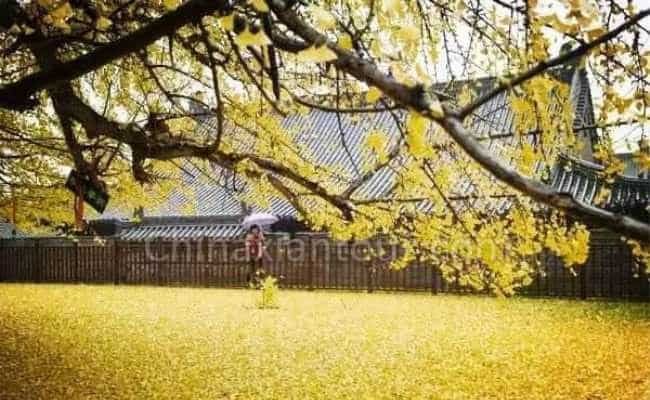 Emperor Li Shimin planted a ginkgo tree, whose leaves turn into a golden carpet showing continuous beauty for 1400 years! In late autumn, nearly all kinds of plants begin to perish but it’s just best time to enjoy ginkgo. 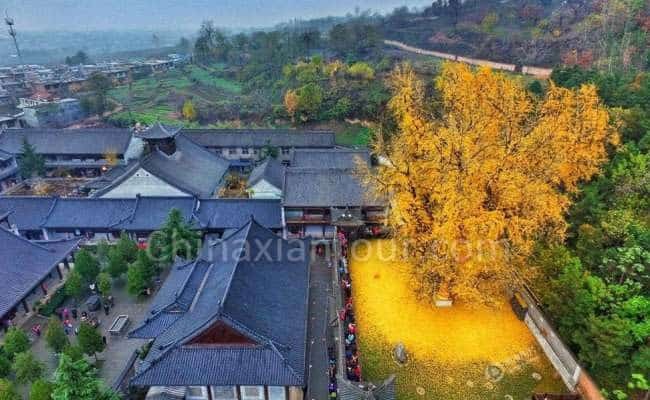 There’s a ginkgo tree, planted by Li Shimin, the emperor of the Tang Dynasty. The tree incarnates time into a golden carpet. 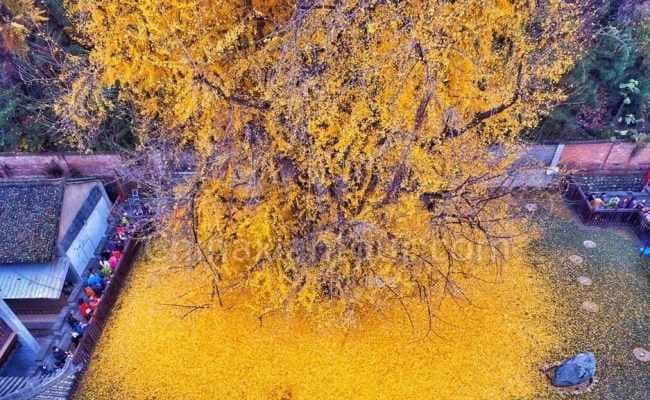 The tree is fully decorated with golden leaves that looks luxury to the extreme extent, as if someone were splashing gold paint, but the painter is the tree itself. 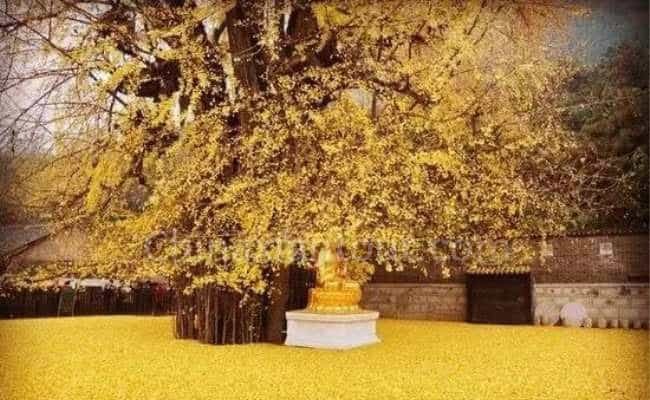 Ginkgo is located in Guanyin Monastery, is said to be planted by Emperor Taizong. Maybe nurtured by some royal atmosphere, it shines brightly over thousands years. The old Guanyin Monastery was also built in the Tang Dynasty. There were Buddhists living here, wearing cloth gown and bamboo hat. They either go up the mountains to collect firewood, or chant scriptures and pray. Yellow leaves on the ginkgo tree falling on the ground and looks like a layer of golden carpet. If one day symbolizes a piece of gold leaf, then how many time changes have such a golden ground witnessed? Not yet stepped into the temple, its golden “immortal breath” can be seen from the distance. Like a flower of sun, it’s in full bloom above the ancient Guanyin Monastery. 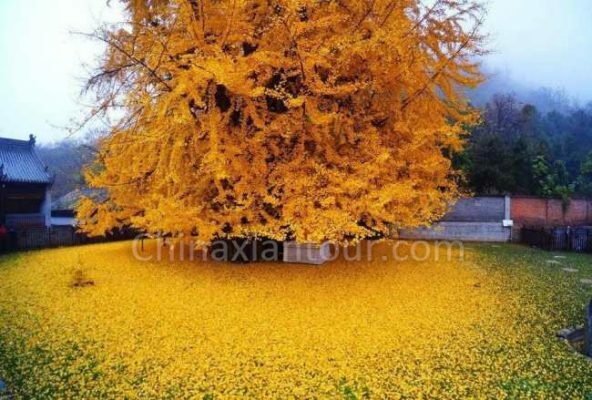 Gilt by autumn wind, the gingko tree has been listed by the state in the protection list of ancient and rare trees. The scenery lures constant stream of visitors to appreciate. Address: Located in Luohandong village, Chang’an District, Xian city. Around 30 km from Xian downtown.